Recently, a gleaning program coordinator, Tammy Rick, was hired to organize harvest schedules of the various specialty crops. Folks in the community benefit from this as they have opportunities to participate in U-picks of blueberries, apples, and raspberries. Tammy also works with a local food hub located in Little Falls, Sprout, as well as the Lakewood Health System in Staples. Through these partnerships, food that would be wasted or composted is placed into the hands of folks in the community that are in need. Research projects that only need a small sample of produce then have an outlet for the excess produce such as potatoes and edible beans. For more information please contact Tammy Rick via email: trick@clcmn.edu. The Variety Block Demonstration was implemented in 2000 in correlation with the establishment of the Living Legacy Gardens. The original design of the orchard was patterned after a typical homeowner’s backyard. Different apple varieties are demonstrated in this orchard as well as cherries and plums. This trial was started in the summer of 2013. The purpose of this study was to discover how planting density effects apple tree growth of Zestar and Honeycrisp varieties in dwarf, semi-dwarf, and standard tree sizes at various plant spacings. The lead researcher on this project is Dr. Thaddeus McCamant. For more information please contact Dr. McCamant: tmccamant@clcmn.edu. In the spring of 2011 an experimental and teaching vineyard was planted at the Central Lakes College Agricultural Center in Staples, MN. A Pilot Winery and a Laboratory for workshops, and on the ground classes, were established at the Staples campus in 2012. The experimental vineyard and the winery provide students with an excellent opportunity to experience the real life aspects of Viticulture and Enology. Grape growing (Viticulture) and Wine making (Enology) is rapidly expanding in Minnesota. The University of Minnesota has successfully developed winter hardy grapes with good wine quality. Consumption of wine is increasing – US per capita has surpassed Italy. Research hints that production of grapes and wine will continue to increase*. Small landowners can grow commercially on less than one acre. Jobs are also being created from tourism, as vineyards and wineries are destinations for visitors*. *Statistics from the Economic Contribution of Grape Growers and Wineries to the State of Minnesota, August 2008. Found on http://www.mngrapes.org/. The earliest wine production has been found in Armenia, Georgia and Iran from 8000 to 5000BC. The oldest winery, that was discovered January 2011 in a cave in Armenia, is over 6000 years old. Romans established most of the growing areas of Europe and developed presses, barrels and bottles. The Phylloxera louse devastated the European vineyards at the end of the 19th century and roots of American vines were grafted to combat these nasty root-sucking insects. Thanks to the legacy of Elmer Swenson, a milk farmer from Osceola, WI who spent 50 years developing grapes , the University of Minnesota is continuing his work to develop winter hardy varieties that are sold all over the world. With over 16,000 grape varieties for genetic variation, exciting attributes are being fine-tuned by scientists at the “U” that will be released in the near future. We at the Central Lakes College are enthusiastic as we watch the rising opportunities in the Minnesota wine and grape industry. For more information please contact Dennis via email: demslie@clcmn.edu. 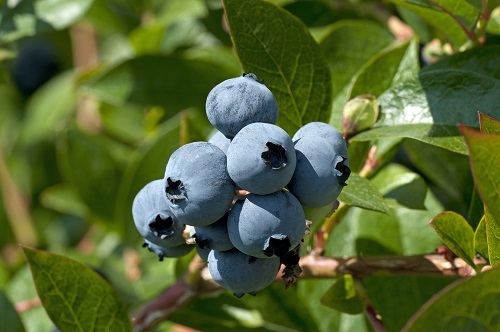 The Ag Center began blueberry research in the 1980s in partnership with the University of MN. One of the plots that still remains today originally was a research trial to look at blueberry production under organic and conventional weed controls as well as differences in irrigation management. Another patch that we still have located at the farm is an old breeding block trial. At the present, the blueberry patches are not under research, but folks from the community are still able to benefit from this research as a blueberry u-pick is implemented throughout the season when blueberries are ripe. This trial was implemented by Dr. Thaddeus McCamant in the fall of 2016 through a research grant. The goal of this study was to analyze the hardiness of pear scion grafted onto pear and juneberry rootstocks. After one growing season, the two rows were consolidated into a single row as many of the grafted scions had died completely due to winter conditions. This project will be completed in the fall of 2018. For more information please contact Dr. McCamant: tmccamant@clcmn.edu. Throughout the years, the Ag and Energy Center has explored different horticultural crops and their hardiness in Zone 3. One block that demonstrates a variety of these crops is the specialty crop block. This block demonstrates fall bearing raspberries, Nanking cherries, Evan’s cherries, Mackenzie aronia berries, and currants.